Natural hair. Why Does It Matter? My grandmother used to say, “You’re hair is your crown and glory.” That essentially means: if you take care of yourself, you’ll feel good about yourself. When you feel good about yourself, you can accomplish whatever you set your mind on. Black women understand this very well. That’s why the black hair industry grosses over $5 billion dollars each year. After several years of introspection, I realized that there was a time in my life when I didn’t like myself. I set out to find out where that self-disdain came from. I realized that there were several factors but one of the biggest was my hair. I consider myself a leader but definitely not a trendsetter. I could care less about the latest fashions and trends. I was never able to afford them. We can do all things as long as we look good, right ladies? Well, I was lucky enough to miss the “jheri curl” growing up in the 80’s. My mom said I didn’t need the chemicals and my grandmother said it looked my hair anyway. I wore ponytails, protective styles. I went to the beauty salon and my older cousins would do it for me sometimes too. By 1989 and all of my friends had relaxers and my cousins were busy teens or graduated. I didn’t know how to do my hair and I was tired of my mom pulling on it. She must of been tired too so a wild ponytail it was. I got teased a lot so I hated my hair. My older cousins always said they wished they had my hair but I didn’t get it. I wanted a relaxer and finally convinced my mom to let me get one when I started the six grade. I learned how to care for my hair and eventually doing my own perms. The wrap was my best friend. My hair always grew longer than my shoulders. I got it cut into styles and it would just grow back. This worked well until my mother was diagnosed with cancer in 2007. She had waist-length locs that she decided to shear so chemo wouldn’t make them fall out. I was devastated because I thought, what if that happened to me? I would be so ugly bald. Then I remembered that my grandmother’s hair grew back a different texture after she had chemo. It was beautiful. My mom’s hair grew back different textures throughout her hair. It was very thin in the middle too. That’s when I realized I didn’t even know what my natural hair looked like It could change and I wouldn’t know it. I felt bad because I didn’t know my hair. I didn’t know how to care for it. What other people thought of me was so important at the time, that I chemically changed my hair follicles. Again, I’m a leader. I hate to conform, especially to mainstream society’s standards. Why did I do that? Why did I think straight hair was better than the coily kinks that genetics gave me? I didn’t know the answer to those questions. I hadn’t seen more than an inch of new growth since I was 12 years old. At the age of 32, I didn’t know if I liked my hair or not. I thought about it for almost two years before I committed to transitioning. You have always had beautiful hair. That is once it started to grow! Most Black babies are born with either a head full of hair be it straight or curly. You on the other hand was born with no hair. By age three months of age it had grown enough for me to be able to “slick” it down. By age two your hair had taken root and you had a head full of curly hair. As the years went on it grew long and thick. Because you were tender headed, like me, you hated me doing your hair as much as I hated doing it. In the 1980s, it was “taboo” for Black women to wear their hair natural in our community unlike in the 60s during the Civil Rights Movement. People, both Black and White would tell you that your hair looked a mess and that you needed to comb “your nappy head” if you wore your hair in natural styles. You always had beautiful hair and I NEVER wanted you to ruin it with chemicals. But since you were getting too old for the pinytails and because you you would be able to manage your own hair I finally agreed to allow you to perm your hair. 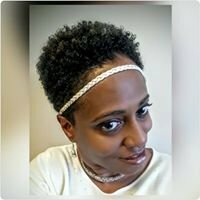 I did my first “big chop” in 1998 and started wearing extentions. They were nice but I have always worn my natural hair so I removed them and started growing my locs. From that day on I started in on you to do the big chop and go natural. LoveLee1 the day you did it was one of the happiest days of my life! Thanks for posting Mommy. You’ve always been one of my hairspirations and my biggest cheerleader. Thank you for sharing that piece of the story and supporting all of my endeavors. I love you to life. Cute! Love it spoken from a mother’s heart.